"Pulling teeth" or dental extraction? Sometimes anologies are made with reference to "pulling teeth". People might say getting their childern to eat vegetables is like "pulling teeth". We believe the reason is that "pulling teeth" is never fun or easy. Dr. Kressin never uses the phrase "pulling teeth" with reference to dental or oral surgical procedures. This phrase is far from an accurate description of procedures requiring skill and attention to detail. Serious complications can, and unfortunately do arise from attempts to (literally) pull teeth. Dental extraction is an important and beneficial dental procedure when performed correctly! Tooth extraction is a common dental procedure performed in most veterinary practices. In Wisconsin, certified veterinary technicians or veterinarians may perform dental extractions provided they have: appropriate equipment, instruments, training and have developed skill from clinical case experience. Dr. Kressin teaches dental procedures to veterinarians and dental radiology for veterinary technicians. Some dental extractions are "awfully simple, while others can become simply awful". Some teeth are particularly difficult to extract. Well informed veterinarians prefer to refer their clients to Dr. Kressin for these more involved cases. Dental radiographs are tremendously important for the evaluation of teeth before, during, and after extraction to avoid patient injury. The "risks" associated with dental extraction are significant. Tooth fracture, failure to remove roots, excessive bleeding and jaw fracture are complications associated with dental extractions (see images below). We have performed full mouth dental extraction on cats and dogs. Full mouth extraction means removing all of the teeth. This is an extensive procedure, however, it is tremendously beneficial for patients with specific condidions. Cats with lymphocytic, plasmacytic, gingivitis or stomatitis are in tremendous pain. They have a life threatening condition and the optimal treatment is full mouth dental extraction. We perform between one and five full mouth dental extractions on cats per month, and clients continue to be very impressed with the value of this service! The earlier we treat these cats, their long-term prognosis seems to be substantially improved. A step-by-step procedure illustrates the extraction of the right upper fourth premolar in a cat; at this link. Dogs with "CUPS" or chronic ulcerative paradental stomatitis also live with chronic pain. It is a tremendous shame to see these animals suffer. They have swollen and ulcerated gums, lips and tongues. Selective tooth extraction, or full mouth dental extraction has been very rewarding for these dogs. We consider teeth as functional "assets" or non-functional "liabilities" for our patients. All teeth serve a function however, some teeth are functionally more important than others. The most important teeth are sometimes called "strategic teeth". These are the canine and carnasial teeth. The carnasial teeth are the upper fourth premolar, and the lower first molar teeth. In viewing the mouth from the side, these are the largest teeth used for shearing food items. Non-strategic teeth may be as important to the owner as the strategic teeth. We make every effort to clarify the client's treatment preferences before performing dental extraction. Our goal is to transform nonfunctional teeth to functional teeth, if we can. Painful teeth are nonfunctional. A build up of calculus on one side of the mouth, and substantially less calculus on the other side may be an indicator of pain. Painful teeth may have enamel defects, may be fractured (with dentin or pulp exposure), severely affected by periodontal disease, have pulpitis (inflammed pulp), pulp infection, root abscess, or be associated with a jaw fracture. The treatment options would be to repair any jaw fracture and either treat the tooth by endodontic (root canal or vital pulpotomy) therapy, or by tooth extraction. Traumatic malocclusion can be uncomfortable. With orthodontic therapy, teeth can be saved and the occlusion can be transformed for improved comfort and function. One clinical case of traumatic malocclusion (shown here) was treated by dental extraction. The owner lived too far from our facility to return for the needed re-evaluations of the occlusion. In this case, dental extraction was more logical and practical. For some teeth extraction is the only option. There may be no reasonable way to transform a particular tooth to a functional tooth. Some owners prefer to extract teeth to avoid further complications or expense. Others want to better understand all treatment options. Some teeth require extraction because they result in malocclusion, dental crowding or teeth grinding. Supernumerary or persistent deciduous (baby) teeth typically are extracted to avoid crowding and accumulation of debris. For some pets, the strategic extraction of deciduous (primary or baby) teeth can allow for normal jaw development. This procedure can immediately eliminate a painful traumatic occlusion and allow for a normal occlusion of the secondary (adult) dentition. This extraction procedure is often referred to as "interceptive" orthodontics. Our initial consultation allows: full disclosure and discussion of benefits, potential procedural risks, prognosis and cost influences of each treatment option. incisor teeth of little functional value. Taking dental radiographs and carefully evaluating them is the mandatory first step in our practice for every dental procedure. This helps identify potential problems that may occur especially with dental extractions. 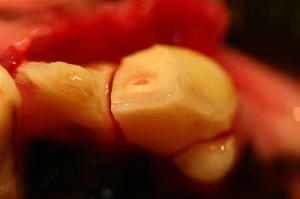 Problems such as: tooth ankylosis, tooth resorption or root dilaceration (curved roots) create unique challanges, and may require special surgical technique. If teeth are severely affected by periodontal disease, the gingival attachments can be incised, and a dental elevator used to separate tooth from the alveolus (tooth socket). This is accomplished by tearing the remaining periodontal ligament using a gentle twist and hold technique with a dental elevator. The tooth then "simply" lifts out of the alveolus. The extraction site is ALWAYS sutured closed to avoid infection and to minimize patient discomfort. Surgical extraction techniques are particularly beneficial when normal healthy teeth, supernumary teeth (many photos using this link) or abnormal teeth require extraction. Teeth with fractured roots must be removed surgically extracted, or a root tip will be left in the alveolus. Some multi-rooted teeth can be severely affected by periodontal disease of a single root. The non-surgical technique will not be appropriate for such a tooth. Surgical extraction is usually our preferred technique for most teeth. A surgical flap is created to allow access to the alveolar bone. High speed drills are used to expose the roots. Multi-rooted teeth can easily be sectioned to allow for safe tooth root removal. Dental luxators, elevators and extraction forceps may be helpful. If difficulties arise during dental extraction, dental radiographs help diagnose and resolve these problems. After the tooth roots have been removed, the tooth alveolus (socket) is meticulously cleaned free of debris. The mucogingival flap is carefully prepared for a tension free closure. The alveolus is ALWAYS sutured closed to avoid infection and to provide optimal patient comfort. A dental radiograph is taken to confirm that the entire tooth has been extracted, and the alveolus is free of bone, root remnants or debris. What complications may occur from dental extraction? is needed to avoid root fracture. above, which requires dental extraction. the thin alveolar bone (tooth socket). 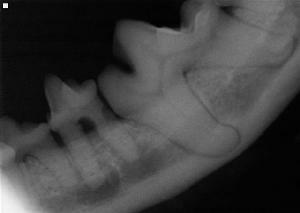 eating (see dental radiograph below). 11 year cat; extensive tooth resorption. the tooth root remnant shown above. bone (tooth socket) injury and jaw fracture. were available to the operator. Closer view of the mandibular fracture. Alveolar bone (tooth socket) is shattered. cat was unwilling to eat (see below). back to the fourth premolar tooth. Cat; mandibular fracture close up view. prior to surgical extraction helps plan the extraction and mandibular bone integrity. Dog (image above); halo lesion observed. adjacent premolar tooth (see below). This adjacent premolar was deformed. This is a tooth with 2 roots! The following images were put together to illustrate important procedural techniques used in dental extraction. The images are very graphic. They are intended to help my fellow veterinarian collegues. I encourage veterinarians to purchase the best equipment and instruments to perform surgical extractions meticulously. Many complications occur from error in technique, as well as from inadequate equipment and instrumentation. Dental extraction procedures require focused attention and time to perform flawlessly. Dental radiographs are extremely important. Every veterinarian that provides teeth cleaning or oral surgery, needs dental radiography capability. I will help any veterinarian interested in formal dental or oral surgery training. I will travel to your hospital or clinic. Efforts to avoid dental extraction complication are well worthwhile. Complications can and do occur. If you recognize complications while performing dental extraction or oral surgery, please feel free to contact me. pulp exposure (see pink nerve exposed). This is a painful condition! It is critically important to take pre-operative dental radiographs prior to tooth extraction. These radiographs allow for a diagnosis and treatment plan. It helps determine if the tooth could be or should be saved, or whether extraction is the best treatment option. This is extremely valuable in avoiding extraction complications (shown with above images). to the alveolar bone (tooth socket). (tooth socket) with an extraction forcepts. to ensure there is no root fracture. using the exact same technique. final root. Notice: this tooth was sectioned. patient comfort after the surgery. The gingival flap is contoured and "released"
to provide a tension free closure. to ensure it will be tension free. This is a tooth with three roots! crown fracture extends into the root. or root canal therapy should be performed. the roots, and section the tooth. Tooth sectioned into three separate roots. with dental extraction of multi-rooted teeth. the palatal root is being elevated. Extracted roots should be carefully examined. The root tips should be smooth. Surgical extraction of upper fourth premolar tooth in a "brachycephalic" breed is a little different than the case above due to dental crowding. This dog was referred for root canal therapy. severity of the fracture into the pulp chamber. Pets are often presented for facial swelling. the molar alveolar bone for tooth root access. to divide this tooth into three separate roots. Oronasal fistula formation is a common complication with dental extraction. were removed to allow normal healing. The remaining incisors were extracted. Surgical extraction for treatment of a traumatic malocclusion. is removed during dental extractions. Additional cases of surgical extraction for traumatic occlusion are shown in the dental occlusion webpage. Surgical extraction of right upper canine. Right upper canine exposed for surgical extraction. avoid puncture into the nose. 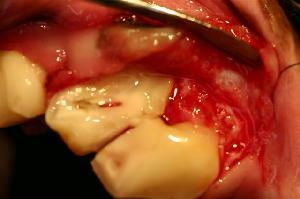 Surgical extraction for treatment of patient with severe periodontal disease. a good reason for dental extraction. the extractions were complete . face due to extreme discomfort. food and oral fluids to enter the nose. Surgical extraction of the upper fourth premolar; anatomy, step by step procedure and special considerations.